Over the past few years, the Adventure column has gradually grown longer and longer and longer until reaching the four page epics of the last few issues. Commencing with this issue, I intend to cut down the length of each article, but from next issue onwards, I'll try to cover two or three Adventures in each issue. This means that I needn't spend as much time on research, the Editor gets more flexibility in magazine layout and you, the readers, get more hints in each issue. Let me know what you think of the 'cut down' format and, as always, suggestions for future columns are more than welcome. My address is at the end of this article. Now, as promised last issue, let's take a look at The Pawn. I first heard of The Pawn about two years ago when our illustrious Editor told me about a great new Adventure for the ST that had unbelievable graphics (I think he was just trying to get me to buy an ST!). 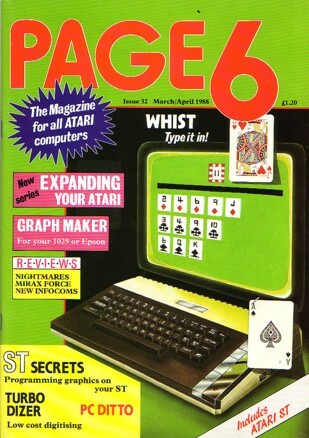 Computer & Video Games previewed The Pawn in April 1986. The article was chock full of superlatives and the accompanying review gave it full marks. I could hardly wait for the 8-bit version to be released. As The Pawn became available for more and more machines, the computer press gave it rave reviews and glowing comments. Imagine my disappointment when I did eventually buy the game and found it to be a bit of a dog! What had happened? How had the computer community been so thoroughly conned? When I re-read all the reviews, I realised that some reviewers had been hoodwinked by personal demonstrations from the staff of Magnetic Scrolls. They had obviously been shown how 'clever' the program was without being shown all its shortcomings – not to mention its bugs! Of all the reviews I read, only one of the reviewers had actually completed the game! The others had wandered about the countryside and hadn't even solved any puzzles! This is disgraceful. The end result was (in my opinion) the greatest marketing swindle in Adventure history. I said there was only one reviewer who had actually finished the game. That happened to be Page 6's own John Sweeney. His is the best and fairest review of the lot (and even then, I think he's a bit generous), so if you're thinking of buying The Pawn, make sure you read John's review first. It's in Page 6 Issue 28 July/August 1987. And please note that 8-bit owners MUST have a 1050 drive or compatible as the disk is in enhanced density. I played The Pawn on an 800XL, not on an ST. The graphics are good, but not great. I've seen much better. They tend to use monotone colour schemes to enable subtle shading effects, but in a lot of scenes, you can't even tell what the picture is supposed to be! So what's the point of subtle shading? All except a few pictures at the beginning load from side B of the disk, hence the disk must be flipped twice every time a new picture is displayed. This becomes so frustrating, that I always played with the graphics off unless I discovered some new territory. The graphics aren't necessary to solve the game. On the positive side, the scrolling is superb. It is so smooth and easily controlled that not even an ST could do better. The plot is devised by a philosophy student – and it shows. (If you've ever known a philosophy student, you'll know what I mean.) Most reviewers comment on the game's sense of humour. It does have a few very funny spots, but the "sense of humour" is more because of the bizarre and unrealistic events – somewhat like Monty Python. Some of it is just plain old bad taste (such as the gratuitous violence, use of alcohol, marijuana and Satanism). It is also heavily influenced by religion and politics, but you'd expect that of a philosophy student. Overall, the game feels 'immature', but I'm sure that will disappear in Magnetic Scrolls' future releases. The area where The Pawn receives my greatest criticism is the parser. An Adventure parser falls within the area of Artificial Intelligence known as Natural Language Processing. A Natural Language Processor essentially consists of three phases – lexical analysis, syntactic analysis and semantic analysis. In simple terms, lexical analysis is where the input string typed by the user is broken down into separate words and checked to make sure they are in the program's vocabulary. Syntactic analysis is where the program makes sure that the words are arranged in a grammatically valid way. Semantic analysis makes sure that the combination of words makes sense. Then and only then should the program act upon the user's input. The Pawn's lexical analysis is reasonably good except that the range of verbs is a bit limited. The syntactic analysis suffers by allowing some extremely complex constructs to the detriment of the simple and more commonly used constructs. The player's efforts to communicate with the program sometimes turn into a frustrating session of trial and error. The game's biggest shortcoming however is the semantic analysis and the resultant command processing. It often produces nonsense replies, grammatical errors, misleading statements, logical inconsistencies and downright mistakes. In other words, it's full of bugs! So beware! When playing The Pawn, there are a few general hints I can offer to make the game as painless as possible. Firstly, remember that you have five senses. EXAMINE, FEEL, SMELL, TASTE and LISTEN TO every object you find and every noun in room descriptions. You will usually get a sensible response which bares little or no relevance to the game. It is the odd occasions that it DOES bare some relevance that you will be thankful for this advice. Also try LOOK IN, LOOK UNDER, SEARCH, READ, PUSH and PULL when they seem appropriate. Ask all the characters about all the other characters. This is the best way to build up a picture of a character's personality, but also helps you to determine who can or cannot be trusted. Any other conversation is pretty limited. The program tries to be clever when conversing with characters, but usually ends up making a fool of itself. Kronos will appear very early in the game and give you a small task to do. Don't leave it at that. Prod him and probe him and ask all sorts of questions, but whatever you do, don't let him leave (as I did) until he's also given you a major task. You cannot finish the game otherwise. Save the game before giving objects away, for if your generosity does not achieve the effect you desire, the object is gone forever. You cannot use the blue key twice! Think about it. Which use gives you the most points? Well, that just about wraps it up for The Pawn (except for the dozens of bugs). If you're still having trouble, refer to the coded hints accompanying this column. Please note that they are a lot more explicit than usual because of the game's difficulty. Next issue I'll be covering Lapis Philosophorum, Stranded and (depending on space) maybe one or two others as well. See you then. 1. Can't remove the silver wristband? 2. Can't cross the dotted red line? 3. Can't buy anything from Honest John? 4. Can't enter the toolshed? 5. Can't move the wheelbarrow? 6. Can't plant the pot plant? 7. Can't get past the guards? 8. Can't stop the Guru laughing? 9. Can't open the Guru's cupboard? 10. Can't get past the boulder? 11. Can't get past the rockfall? 12. Can't survive the cold? 13. Can't pick up the snow? 14. Can't get past the snowman? 15. Still can't get past the snowman? 16. Can't climb the icy ramp? 17. Can't open the door on the landing in the ice tower? 18. Can't get the Princess out of the ice tower? 19. Can't open the wooden door in the tree? 20. Can't remove the wooden boards in the tree trunk room? 21. Can't find a use for the ballot boxes? 22. Can't open the safe? 23. Can't enter the lift? 24. Can't get the lumps? 25. Can't cross the lava? 26. Can't get out of the maze? 27. Can't get past the alchemists? 28. Can't open the tomes? 29. Can't get past the paper wall? 30. Can't descend safely from the paper wall? 31. Can't open the double doors? 32. Can't get past the porter? 33. Can't see the relevance of Jerry Lee Lewis? 34. Can't see what's in the fridge? 35. Can't get past the dragon? 36. Can't survive even a single move in Kronos' workshop? 38. Can't get past the dragon on the return trip? 39. Can't enter the cream doors? 40. Can't escape the brilliant void? 43. Missing a metal key? 44. Missing a pot plant? 47. Missing a blue key? 48. Missing a wooden key? 49. Missing a light source? 50. Still missing a light source? 51. Still missing a light source? 52. Missing a ballot paper? 54. Missing a hard hat? 55. Missing a black potion?